The highly pathogenic Phytophthora ramorum, causal organism of sudden oak death (SOD), is established in forests of the Pacific Northwest (USA) and is threatening invasion of other regions. 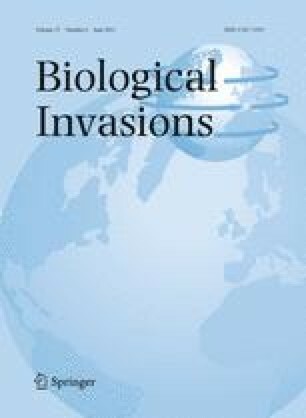 Given the breadth of its host range, with dozens of asymptomatic ornamental hosts and with oaks, Quercus spp., in the red oak (Erythrobalanus) subgenus particularly susceptible, we investigated the consequences of its invasion and establishment in oak-dominated deciduous forests of the eastern USA. We evaluated the nature and extent of pathogen invasion using vegetation assessments coupled with growth simulations. The woody plant community was assessed in three strata (upper, mid- and lower) and was used to characterize forest composition and structure. Using the Forest Vegetation Simulator (FVS), we then projected woody vegetation growth 50 years into the future with and without the effects of SOD. In forest simulations lacking pathogen invasion, little change in composition or structure is forecasted. Both red oaks and white oaks (subgenus Leucobalanus) increase slightly but significantly over the length of the simulation. In contrast, in SOD-affected forests our projections predict a significant loss of red oaks within 10 years of pathogen invasion. Basal area of white oaks and non-oaks is expected to increase more so in the absence of red oaks. The loss of red oaks to pathogen infection will result in greater increases in red maple, Acer rubrum, and yellow poplar, Liriodendron tulipifera, than in forests free of SOD. Loss of red oak represents a significant loss of hard mast, with potentially devastating consequences for wildlife. Red oak loss will also affect decomposition rates, nutrient cycling, forest structure, and timber values, with consequences for forest health and sustainability. We would like to thank Melanie Antonik, Tom Coleman, W. Rodney Cooper, and Aerin Land for assistance, Robert Paratley for help with plant identifications, and Angela Schoergendorfer for statistical advice. Jeffrey Stringer and John Obrycki reviewed an earlier version of this manuscript, and the comments of two anonymous reviewers greatly strengthened this work. This research was supported by funds from the USDA Forest Service Southern Research Station and McIntire Stennis funds from the Kentucky Agricultural Experiment Station, and is published as Experiment Station Project 10-08-046.